Four identical Rosslau-built diesel-electric paddlers were introduced in 1963 and 1964 (Wilhelm Pieck), Three vessels were re-named in 1991 after the fall of the Communist government, but Karl Marx, already laid up awaiting refit, never sailed under its intended new name of Daniel Poppelmann as cash for the planned work ws not available. JF Bottger was withdrawn in 1992 Two large motor vessels took the names and places in the fleet of Grafin Cosel and August der Starke for the 1994 season onwards. Poppelmann and JF Bottger were refurbished as part of a skills development programme for unemployed people but put into static use at Dresden-Neustadt dock as youth hostel accommodation ships. 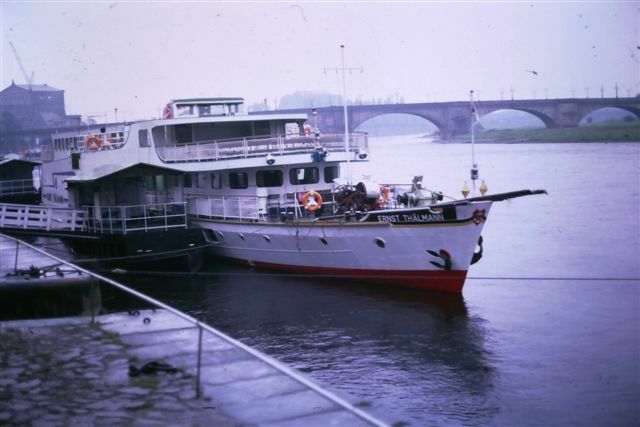 DEPV Karl Marx - Used as a hotel ship at Dresden-Neustadt with the name "Koje"
Poppelmann (which never sailed under this name) has now been called "Koje"